(ii) dresses stone to put a finish on blocks, after they have been roughly shaped by scabbier. rides or accompanies trains of tubs or wagons containing stone; attaches and detaches rope to or from tubs or wagons where required. removes over-burden (top-soil) with pick and shovel (hand or steam); where over-burden is heavy or tenacious, explosive is sometimes used, or the over-burden is removed by chamfering and piling. blows down or out, or rends open, with explosive, the stone face; sees to drying of shot hole, inserts charge, tamps it up and fires it (with electric battery or safety fuse); often necessary to fire a series or range of shots simultaneously or after each other; by similar, hut smaller, operations, breaks up larger boulders of rock which have been hewn from rock-face; cf. fireman (071); in granite quarries these boulders are never fired, but are split, see plug and feather man. breaks stone with heavy hammer (mall) into rough blocks, roughly a foot cube, ready for further cutting into 4 or 5 setts; in some quarries this work is done by settmaker (575) q.v. a delver q.v. who works on lowest "bench" (step, tier or level), where quarry is worked in "benches". (iii) in mines pushes filled trucks on to cage at shaft bottom, and sends stone up to surface; signals to winding engineman; draws out empty wagons on descent of cage. (iii) in large quarries assists engineman in moving large wagons. a sledger q.v. who breaks up stone after blasting, with a large hammer, and loads it into tubs for removal; cf. filler. breaks up stone with small hammer. looks after workmen's cabin; cleans mess- rooms; boils water for men's meals; sometimes also carries tools; cf. tool boy. (ii) cuts channel in stone, by hand, using hand tools. roughly cleans stone with pick when first it comes out of quarry. a quarrier q.v. who undertakes stone getting in a mine or quarry on contract; pays men working under him. operates "conveyor" (belting which carries stone from place to place in quarry); controls conveyor by means of hand levers and looks after its running. controls stone-crushing machine by operating various levers; oils and greases working parts and looks after its running. feeds crushing machine with broken stone, regulating the supply of stone by means of trap door which is operated by hand levers. (iii) see plug and feather man. 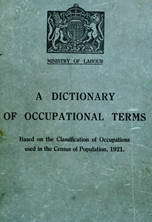 a labourer q.v. paid time rate of wages. loads and unloads wagons, helps in repair of quarry roads and does other unskilled work; cf. loader. loosens and gets blocks of stone from solid rock by various tools, when it has been blasted down; may also split blocks of stone with hand tools to reduce to convenient size. assists delver q.v. in getting stone and in loading it into trams. separates inferior stone from the better. removes loose stone, etc., from face of quarry with pick and shovel; sometimes done by driller or miner q.v. see driller (hand or machine). drills holes for blastings, for trial borings, or for "plug and feather" (see plug and feather man) with hand or machine drills; sometimes also bars down loose rock after shot has been fired; cf. quarrier. a driller q.v. who operates an electrically-driven drilling machine in a stone quarry. does slight repairs to plant and machinery. loads stone by band into wagons or boxes for removal from quarry face to another part of quarry; work may be performed by quarrier q.v. (ii) see hewer; sometimes specifically designated, e.g. alabaster getter, basalt getter, blue rock getter. cuts and cleaves flag rock, with picks, wedges, and spalling hammers, in readiness for flag dresser (575) q.v. works on face of rock in quarry, preparing it for setting up of large percussion drill; has a rope round him to protect him from falling; work sometimes done by miner or driller q.v. drives headings at foot of rock face, and puts in large charge of explosive. carter, cartman, haulier, horse keeper, pony driver, teamster, wagoner, wagonman; drives horses about quarries; often also grooms and feeds them, see horse keeper. feeds and grooms horses under supervision of horse keeper q.v. (ii) in charge of stables, supervises horse feeder and horse driver q.v. and attends to harness. a driller q.v. who drills holes in stone with double-ended drill i.e. "jumper"; obsolescent ; work now done by driller q.v. blasts and hews stone called "Kentish rag," for removal to crusher or to railway siding. in Cornwall and Devon, see cabin boy. breaks up stone or dresses small blocks with a knapper, i.e., a small hammer of special shape. does odd work in or about mine or quarry. (ii) loads stone in railway trucks or motor lorries for conveyance from quarry. keeps machinery, e.g. pulley wheels, wagon wheels and sheaves, oiled and greased. general term for any man who attends to any of the machines used in mines or quarries for drilling, cutting, or breaking stone, including borer, breaker (machine), crusher feeder, driller, millman, rock cutter, stone cutter q.v. in small quarries in Scotland gets stone (see qualifier) and rough dresses it in the quarry. see quarrier ; sometimes specifically designated, e.g., alabaster miner, hath stone miner, grit miner. picks out unburnt pieces of limestone after kilns have been emptied; cf. stone picker (675). a driller (hand or machine) q.v. who splits rock by drilling holes along desired line of cleavage, inserting in each hole wedge, or "plug," of iron between two "feathers" (or thin wedges) of steel, and hammering on plugs till fracture is made. as for powder monkey (054). (iii) (digging ) gets loose gravels, chalk, flint or sand by digging with pick and shovel or with steam navvy; may also blast down hard aggregations, see blaster; sometimes specifically designated, e.g., chert quarrier, grit quarrier, grit rock quarrier. Devon and Cornwall term, see quarrier (basalt). (ii) general term covering any worker engaged in a quarry, including getter, miner q.v. a labourer who restores land after excavating operations are complete. Forest of Dean, see barer. in mines, makes and repairs underground haulage roads; looks after supplies of timber or propwood, and clears away rock fallen from roof; in quarries keeps roads in repair. a quarrier q.v. who gets rock, e.g., granite, whinstone, used in making roads. (iii) cuts out rock by working hole with pick and driving in wedge to split blocks away from face. loads rough lumps of stone on trucks to he conveyed to crusher. (ii) pushes corves from block cutters to sett makers (575) q.v. roughly shapes, dresses or squares up stone into block with scabbling or spalling hammer; (scabbling hammer has square faces and weighs about 18-22 lbs., or sometimes one square face and one pick face); sometimes done by hand driller or quarry mason (575) q.v. shovels crushed stone into cylindrical revolving screens for grading, or generally attends screens automatically fed from crushers, to classify broken stone according to size, e.g., road metal: opens trap door of hopper into which screened stone is run, thus loading tubs placed underneath hopper, and pushes tubs to landing point. a quarrier q.v. who gets rough blocks of stone (granite, basalt, whinstone, etc.) with straight-faced fractures, to he made into "setts" for road paving; cf. settsman (575). loads stone into ship or barge hy means of derricks, slings and rollers. prepares "shoddy" (smaller stones from quarry), squaring them up to useful sizes. a driller q.v. who drills holes for blasting, by hand or machine. see brakesman ; cf. pointsman (704). transmits orders from foreman to brakesman or engine tenter (950) q.v. .
fills skips or rubble boxes to be lifted by crane, or drawn on rails; "skips" may be in form of tubs, or a species of wagon, commonly used for removing overburden or topsoil. (ii) in Cornwall pushes quarry wagons between face of quarry and stone breaker. attaches chains and clips to large blocks of stone to enable them to be lifted by crane. see plug and feather man. (iii) works on stage, up to which stone is thrown; he in turn shovels it up to stage above. removes lumps of rock from quarry floor by means of bars and wedges, or by explosive. checks time tickets; also makes out tickets for stone and material passing over weighbridge. works tipping apparatus at spoil heap; keeps spoil heap levelled down at end of tip. carries tools, i.e., drills for sharpening, hammers for repair, to and from smithy; cf. cabin boy. a loader q.v. who loads and unloads trolleys, i.e., railway vehicles without sides. see brakesman, cf. pointsman (704). weighs stone as it passes in wagons over weighbridge; or brings round travelling machine to working places; sometimes also keeps records of wagons sent out and labels to destination; may keep a record of number of men employed in the quarry.